Since its foundation in the year 1942, Asian Paints has come a long way to become India's largest and Asia's third largest paint company, with a turnover of Rs. 109.70 billion. Asian Paints today operates in 17 countries and has 25 paint manufacturing facilities in the world which is servicing consumers in over 65 countries. The organization has always been a leader in the paint industry, also creating new concepts in India like Colour Worlds, Home Solutions, Colour Next, and Kids' World. It was set up as a partnership firm mainly by four friends who were willing to take on the world's biggest, most famous paint companies operating in India at that time. Over the course of 25 years, Asian Paints became a very much huge corporate force and India's leading paints company. Today, it is double the size of any other paint company in India. Asian Paints is India's largest paint company and Asia's third largest paint company, with a turnover of Rs 109.70 billion. The group has an enviable reputation in the corporate world for professionalism, fast track growth, and building shareholder equity. Besides Asian Paints, the group operates around the world through its subsidiaries Berger International Limited, Apco Coatings, SCIB Paints and Taubmans. Asian Paints has always been ahead when it comes to providing consumer experience. It has set up a Signature Store in Mumbai and Delhi in India, where consumers are educated on colours and how it can change their homes. Vertical integration has seen it diversify into products such as Phthalic Anhydride and Pentaerythritol, which are used in the paint manufacturing process. Asian Paints also operates through 'PPG Asian Paints Pvt Ltd' (50:50 JV between Asian Paints and PPG Inc, USA., one of the largest automotive coatings manufacturer in the world) to service the increasing requirements of the Indian automotive coatings market. Asian Paints has formed another 50:50 JV with PPG named 'Asian Paints PPG Pvt Ltd' to service the protective, industrial powder, industrial containers and light industrial coatings markets. Asian Paints aims to become one of the top five decorative coatings companies world-wide by leveraging its expertise in the higher growth emerging markets. Simultaneously, the company intends to build long term value in the industrial coatings business through alliances with established global partners. Asian Paints approaches the environment issue from the perspective of waste minimisation and conservation of resources. Determined to reuse, recycle and eliminate waste, Asian Paints' material losses in manufacturing have reduced substantially over the last few years. All the paint plants and chemical which are manufacturing plants of Asian Paints have ISO 14001 environmental certification. All the paint plants have achieved 'zero industrial discharge' capability. This has been achieved by the installation of upgraded effluent treatment facilities and installation of reverse osmosis plants in conjunction with appropriate recycling and reuse schemes. The emulsion manufacturing facility has also achieved 'zero waste' status. They have adopted the principles of "green productivity". Some of the organization's innovative schemes which are mostly to enhance green productivity are dealer tinting systems which has resulted in large batch sizes; bulk storage facility for monomers which reduces wastage; Use of natural gas which is a cleaner fuel; solvent recovery plants have been set up which has resulted in zero reduction of solvent disposal; improved incinerating systems and reverse osmosis. Asian Paints along with its subsidiaries has operations in 17 countries across the world and 25 paint manufacturing facilities, servicing consumers in 65 countries through Berger International, SCIB Paints-Egypt, Asian Paints, Apco Coatings and Taubmans. Asian Paints operates in 5 regions across the world viz. South Asia, South East Asia, South Pacific, Middle East and Caribbean region through the five corporate brands viz. 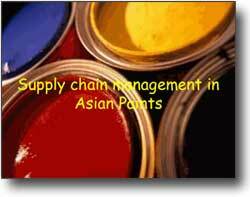 Asian Paints, Berger International, SCIB Paints, Apco Coatings and Taubmans. In 7 markets, it mainly operates through its subsidiary, Berger International Limited; in Egypt through SCIB Paints; in 5 markets in the South Pacific it operates through Apco Coatings and in Fiji and Samoa it also operates through Taubmans. Asian Paints has harnessed the powers of state-of-the-art supply chain system using cutting edge technology to integrate all its plants, regional distribution centres, outside processing centres and branches in India. All the company's paints plants in India, two chemical plants, 18 processing centres, 350 raw material and intermediate goods suppliers, 140 packing material vendors, 6 regional distribution centres, 72 depots are integrated. The supply chain runs through a wide spectrum of functions right from materials planning to procurement to primary distribution. The organization has played a pivotal role in improving operational efficiencies and creating agile procurement, production and delivery systems. It has also enhanced the flexibility of operations, lowered output time and reduced delivery costs, while improving customer-servicing levels and profitability. The Supply Chain Management is backed by IT efforts that help the company in demand forecasting, deriving optimal plant, depot and SKU combinations, streamlining vendor relationships, reducing procurement costs and scheduling production processes for individual factories. At Asian Paints, Research & Development has played a significant role in the growth of the organization. The company has continuously invested in R&D. The entire decorative coatings portfolio for the Indian market and for overseas ventures has been developed in-house. The technologists not only develop new products and improve upon existing formulations but also act as a pillar of support to other functions, viz Supports Manufacturing in process cycle time reduction and improves productivity by alternate / break through processes. Provides solutions to environmental issues by minimizing waste at the time of generation and also in recycling. Aids Marketing in providing technical tools/USPs to demonstrate and push new products. Support materials by providing new Raw Materials as alternate to current one to give them negotiating power and also alternate vendors for supply chain flexibility. 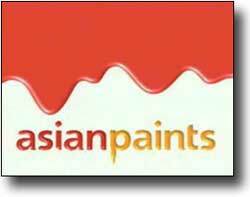 Asian Paints was included in Forbes Magazine's - Asia's Fab 50 List of companies in 2011, 2012 and 2013. Asian Paints was ranked 13th amongst the top paint companies which are in the world by Coatings World - Top Companies Report 2013 (July 2013 Issue). In March 2012, Asian Paints was presented the Asian Centre for Corporate Governance and Sustainability Award for the Best Governed Company in 2011. Mr. P M Murty, the then MD & CEO, Asian Paints received the 'CEO of the Year' award from Business Standard, one of India's leading business dailies (March 2011). Asian Paints had received the Best Audit Committee Award from the Asian Centre for Corporate Governance & Sustainability (Feb 2011). Awarded the "Sword of Honour" by the British Safety Council for all the paint plants in India. This award is considered as the pinnacle of achievement in safety across the world. Forbes Global Magazine, ranked Asian Paints amongst the 200 'Best Small Companies of the world' in 2002 and 2003 and amongst the top 200 'Under a Billion Firms' of Asia in 2005. The Asset - one of Asia's leading financial magazines ranked Asian Paints amongst the leading Indian companies in Corporate Governance in 2002 and 2005. Asian Paints has received the Ernst & Young 'Entrepreneur of the Year - Manufacturing' award in the year 2003.